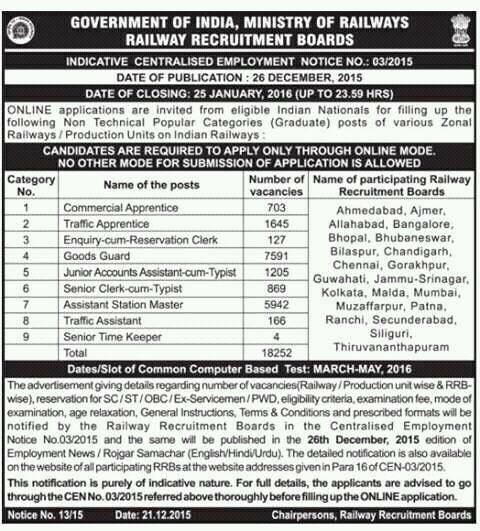 Railway Recruitment Board Non-technical recruitment 2016 for 18252 Posts :Indian Railway Recruitment Board (RRB) Ministry of Railways has recently released a recruitment notification to fill 18252 vacancies of Commercial Apprentice, Traffic Apprentice, Goods Guard, Junior Accounts, senior clerk, Traffic Assistant and Enquiry clerk. Interested eligible candidate who are looking jobs in Indian Railway can apply online from official website www.indianrailways.gov.in from 26 December 2015 to 25 January 2016. RRB employment notification more details like age limit, Educational qualification/ selection process/ how to apply/ application fee and other details given below. Educational qualification: Railway Recruitment Board invites applications from the candidates who have passed degree of Graduation in any stream from a recognized University. Note - Full details of Advertisement like age limit/ educational qualification/ Application fee and other details will be availed on this page from 26 December 2015. The candidates will be selected on the basis of Written Test only.